Sets a fundraising goal of $1,000 to hire entertainers to visit children with cancer in CT hospitals this summer. Click HERE to learn how you can support CTKG® Megan’s fundraiser and $1,000 goal! 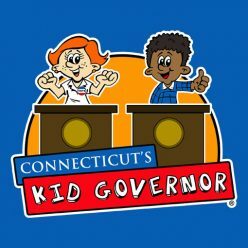 Click HERE to learn more about 2018 Connecticut’s Kid Governor®-Elect Megan Kasperowski! The American Society for the Prevention of Cruelty to Animals®(ASPCA) has announced that 2017 Connecticut’s KidGovernor (CTKG) and Milford resident Jessica Brocksom will be honored as the ASPCA Tommy P. Monahan Kid of the Year Award Winner. The national award recognizes a child who has made a unique and impactful commitment to animal welfare. Brocksom was chosen as this year’s recipient after promoting her platform “Helping Animals, Those Without a Voice” throughout the state of Connecticut following her election and inauguration as Connecticut’s Kid Governor… Read more!